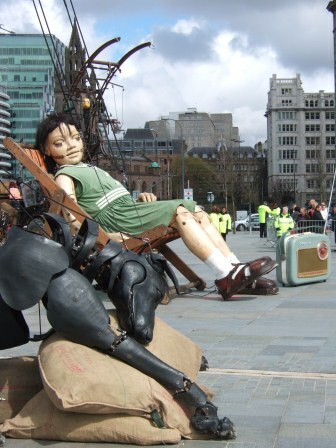 A third giant will join the Little Girl and her dog on their World War I journey in Liverpool this summer. The 24ft tall ‘Grandmother of Liverpool’ will stride through the streets as part of the Memories of 1914 spectacular in July. The new giant will premiere at an event in her home-town of Nantes in France next month, with her second appearance in Liverpool from July 23-27. Details of the story surrounding the new performance by French street theatre experts Royal de Luxe are yet to be revealed, but the 85-year-old Grandmother will make her ‘entrance’ travelling through time and arriving inside St George’s Hall. Members of the public have the chance to see her up close in the Great Hall where she will be sleeping, with viewing times from 10am to 1am on July 23, and 7am to 7pm on July 24.